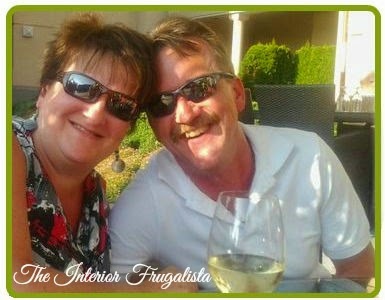 This week I have a really fun blogger to introduce you too. Marie from The Interior Frugalista . 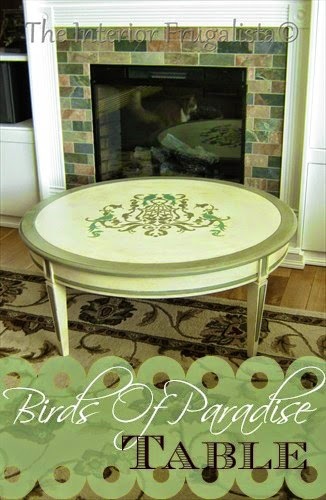 You will love meeting this special DIYer and sweet and talented blogger. Marie is so warm and open that the first time you meet her you will feel like you have known her forever. Enjoy getting to know Marie. Have a wonderful week end. 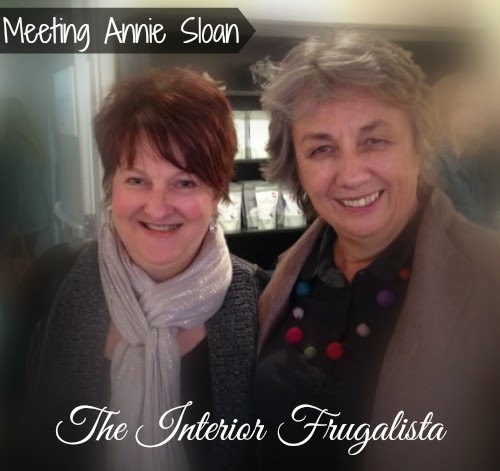 Hello fellow readers of Junk Chic Cottage, my name is Marie Blackburn and I'm the blogger behind The Interior Frugalista. I was tickled pink when Kris emailed to say I made the popular Saturday Spotlight list. So many bloggers that I admire and look up to are on this list and so I feel honored to have been added! Life Behind the Blogger, where shall I begin? Lets start with a mugshot of me and my side kick Darcy, a.k.a. Mr. Frugalista. 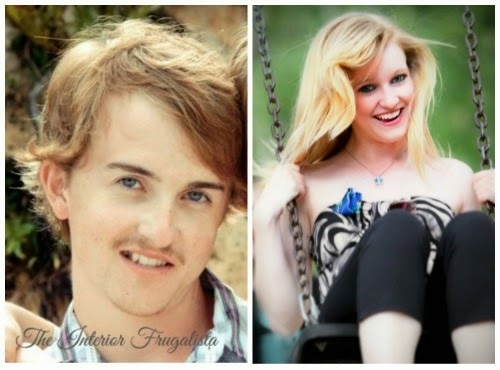 We are the proud parents of two grown children, our son Brandon and our daughter Victoria. They got those beautiful blue eyes from their Father! We are anxiously awaiting the bird of our first grand baby in April. 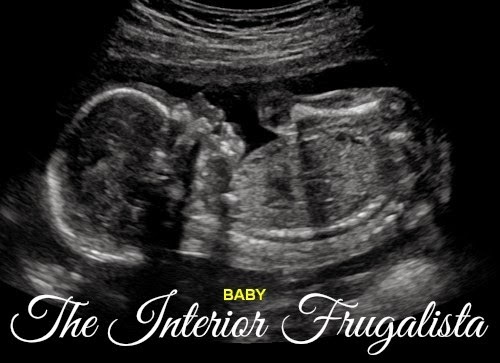 I can't wait to spoil him rotten! We became empty nesters in 2014. I had always envisioned that stage in life to be where we'd be footloose and fancy free, eating Hagen Daz ice cream for supper, the house would remain spotless, and our days of worrying about the kids would be over. Ha! Well eating ice cream for supper, especially at our age, is just asking for trouble and besides why eat in when you can dine out. I've gotten lazy with my housekeeping skills because heck who is going to see the mess. And as all of you with grown children can attest to, you never stop worrying about your kids! 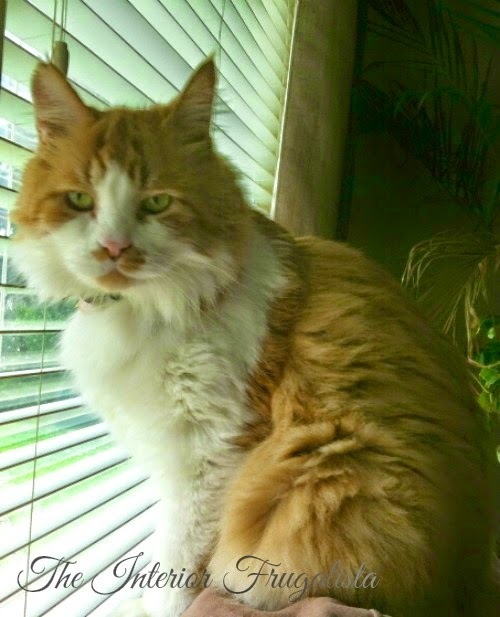 Thankfully we have our feline side kick Rex to keep us company. If cats could talk this poor fella would probably say, "lady I know you're lonely but can you just leave me the heck alone". Now that you've met my family let me tell you a bit about myself and my passion for all things DIY. I have been doing crafts and room makeovers since I was a child. I was the babysitter who sat at the table with the kids and made crafts. I am the eldest of seven children and growing up there was no such thing as having your own room so I shared it with a sister. My our room was my sanctuary and I loved spending weekends organizing and decorating (much to the chagrin of my sister). In high school I hated Home Economics Class (now I'm dating myself) and wanted to take Shop (not an option for girls in those days). As an adult I embraced my inner Susie Homemaker, put on that apron (of which I made myself), and taught myself how to sew. It was part of my parent's first bedroom set and made it's way into our bedrooms growing up and then later passed down to my children. When our daughter needed a desk for doing homework her room wasn't large enough to accommodate a dresser and desk. We removed the top drawers and turned it into a pull out desk/faux secretary. 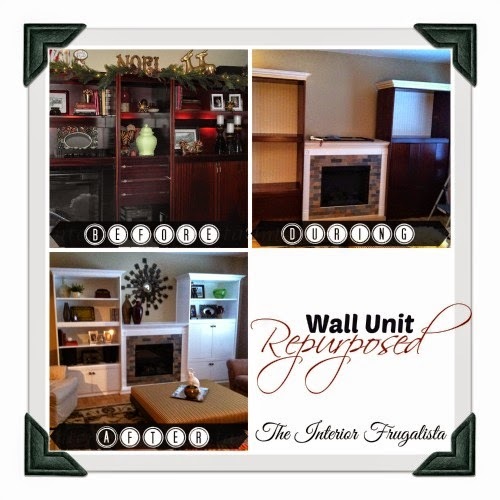 When she no longer needed it I gave it a makeover with chalk paint for our guest room. ...and the bonus, we gained a small wine fridge! Speaking of the kitchen, it felt like we were preparing meals inside a wooden box. So with a few cans of paint and some elbow grease we were able to completely transform the room. You can see our laundry room for under $500.00 HERE. How we repurposed louvered bi-fold doors into a back yard privacy screen HERE. Two years ago when I was humming and hawing about starting a blog for the purpose of documenting our DIY projects for friends and family, the name came to me in a dream. I woke up so excited about the name that I grabbed a coffee, found a blog template and the rest is history! I knew absolutely nothing about blogging. I'd never heard of SEO and html. Photography was pressing the camera button on my iPhone and hoping for the best. My lack of blogging skills became evident real quick when I started poking around the blogosphere. To say it's been a learning curve and a lot of work would be an understatement. Who says you can't teach an old dog new tricks! I've never regretted hitting the publish button. Blogging has rocked my world and brought many blessings, friendships, and opportunities. One of the highlights was meeting Annie Sloan, my Chalk Paint Idol. So much fun! So now that we're no longer strangers, I welcome you to grab a coffee and hop on over to The Interior Frugalista for a visit. I'd be even more thrilled if you introduced yourself and left me a note. Thank you so much Kris for introducing me to your readers. It's been fun going down memory lane! Thank you Marie. Loved having you here on Spotlight. Ok Bloggers after reading and getting to know Marie better you can see how fun and sweet and what a fantastic DIYer she is so hop over and introduce yourself to her. Hi Kris, I totally enjoyed reading more about Marie and her blog. Wishing you a nice weekend! Thanks somuch Julie, glad you enjoyed it! Great summary of yourself, Marie! So nice to meet you Marie! You have great style and serious skills! I'm heading over to follow! A great feature Kris! Congrats, Marie, on joining the Spotlight! It's always fun learning a bit more about the people we follow and enjoy! This is soo exciting for Marie! 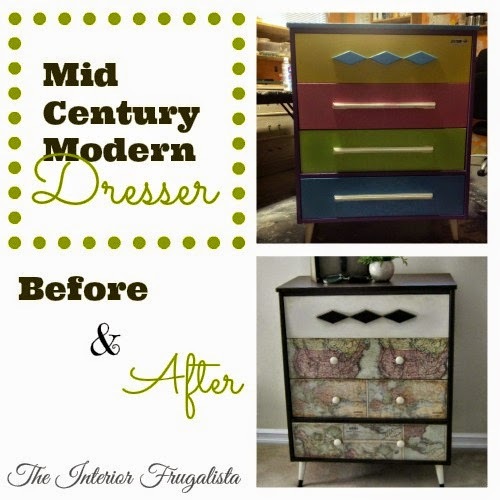 She is one of my blogger friends that loves junk as much as I do! Great blogger pick Kris!! Thank you so much my junk'n blogger friend and #diysundayshowcase co-host! Such a delight to meet the very talented Marie! Her makeovers are fantastic...love her can-do spirit. Marie has transformed some beautiful pieces. Thanks for sharing, Kris, I will visit her soon. I love reading Marie's blog and hearing about her story! 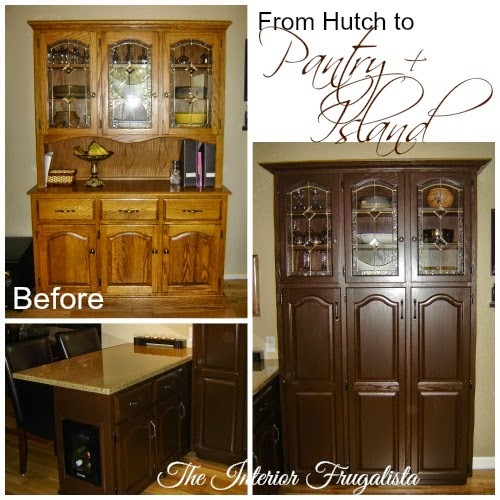 So many gorgeous makeover projects that Marie has done...that hutch project is truly over the top!....Truly enjoyed seeing all of Marie's projects and seeing her tremendous talent!! !....Great feature!! !...Have a great weekend Kris and Marie. Thank you so much Shirley for your sweet comments. I'm glad you enjoyed the feature! I love how Marie has made pieces work in small spaces. I can totally identify with her. I loved my home ec classes, but resented that we couldn't take shop. Ha, so glad to hear I wasn't the only one! There wasn't a lot of girls lining up for shop glass, I was an odd ball. Hello Kris! Lovely share today! 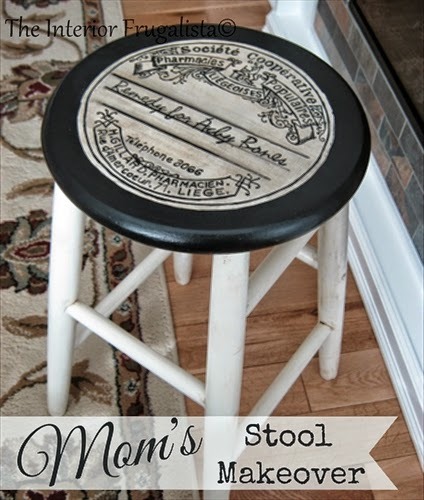 I just have so much fun seeing what people are doing with repurposed furniture. It's always a thrill to see what can be done. 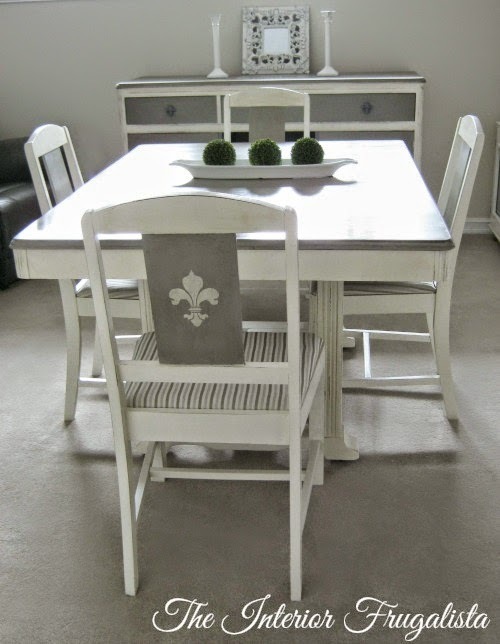 Great white painting, and ANNIE SLOAN! WOWSERS! Now there is a woman who's turned her passion into other peoples' passion. LOL Anita, it was such a treat meeting Annie. I have so much respect and admiration for her and she was so down-to-earth. She made my day when she said she loved the name of my business. How wonderful to meet Marie! Thank you so much for introducing her, Kris. It sounds like we have much in common and I am going to visit her blog from here. 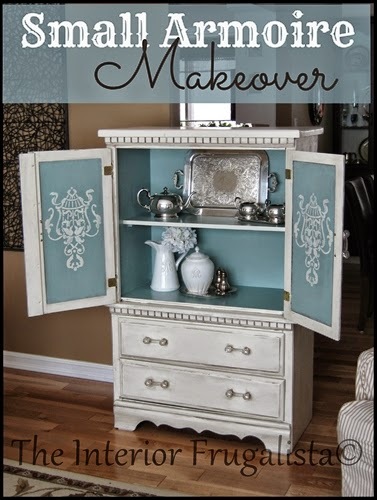 I love her furniture makeovers; she's done some really wonderful DIY projects, too. Thank you so much Kathy, I appreciate your sweet comments and your visit! Great choice of blogger Kris! I love Marie and her projects, too. Isn't it funny how our creativity is unleashed when we feel we don't have enough money? How lucky we are, don't you think? Awe, I feel the same way about your talents Anne! I couldn't agree more about our creativity being unleashed when we're on a tight budget. I always say, "living on a budget forces us to turn lemons into lemonade with the sweet elixir of creativity". How wonderful to meet Marie! I love all her diy projects. I think I need to pop over to her blog now..
What a talented lady. Great choice. I have gone over to her site and I am now following her. Hope you had a nice sunny week in Florida. Love hearing about other DIY husband and wife duos. Glad you could relate to our antics Sandi! I don't believe you let your house get messy! Your work is great! What a beautiful Spotlight! Very talented indeed. Kris you do such wonderful work over here on your blog meeting and getting to know bloggers that most of us have not met to then bring us all together at one place sharing in reading and getting to know your featured spotlighted guest. Thank you so much Dore! PS. I hope your mothers move was a smooth one. Sweetly comforting and felt cozy like a perfect little new home for her. My Mother did this very thing about a year and a half ago, moving from her home into a senior apartment, surprising enough she has all her farmhouse treasures placed just like she likes in in a one bedroom place making it a cozy likable place she calls home. Yes, she has her sad moments of things not having quite the same feeling as her home of rustic charm, but as time goes by she has come to love living small. Something we have i common with our Mothers. Kris thanks for the introduction to Marie. The spotlight always gives an opportunity to learn about other bloggers I might never of known about. I will check out her blog she is very creative. I hope you enjoyed your visit and I didn't disappoint Vera. Appreciate you stopping by my little corner of the blogosphere. You're so sweet Nancy! I always appreciate your visits and sweet comments. You make me blush Robin! I always appreciate your visits and kind comments and I especially enjoy following you and your amazing talents. so nice to meet marie! thanks for sharing her with us, kris! What an awesome blogger to feature here Kris! I just became familiar with Marie towards the end of last year, but love her already! 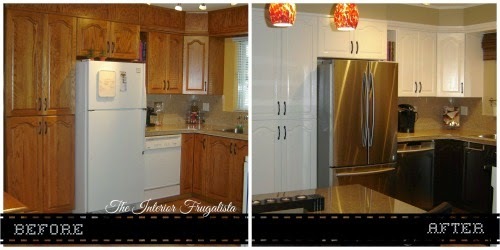 Her blog is full of great projects and tons of inspiration. She is quite talented and I saw a few projects here that I missed on her blog.